Dave Carlisle is the best builder ever. He and everyone on his staff was an absolute pleasure to work with. Dave takes customer service to the highest level. He is extremely knowledgeable about the home building industry, both old school and modern techniques and products. Dave always had at least two solutions to any problem that came up (inevitable in the building industry) and they never cost any more and often ended up being features of our house. We recommended him to our neighbors who are building a new house and they contracted with him without even interviewing other builders because they liked him from the get go and admired the quality of the home he built for us. I couldn't recommend him any higher and would work with him and his staff again any time. I have worked with Dave Carlisle and his team at Bayview Builders LLC on several projects. Most recently on 2 kitchen in Annapolis. Their quality of craftsmanship is beyond excellent and their service impeccable. You can count on them to complete your project exactly as you imagined, maybe even better. Bayview Builders is a rare entity. This General Contracting company not only delivers what they promise, but they do so within a reasonable time frame and with exceptional, high quality work. Equally important, they understand the meaning of the word "budget". They don't take short-cuts or cut corners. They worked with my architect and myself to find cost effective alternatives to help us keep within our budget. Renovating, then adding on to our little 1937 Cape Cod became a two-stage project (at my request) and Bayview Builders managed the logistics, materials, subcontractors and inspections seamlessly. This is the 7th house I've built or renovated over the years so I have some experience working with builders and architects. My experience with Bayview Builders tops them all. Bayview Builders always stresses the importance of the “trinity” – the successful collaboration between client, architect and builder. 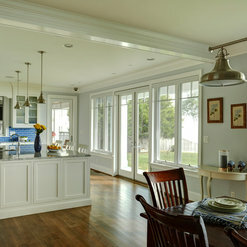 Having come up in the carpentry trade, the owner Dave Carlisle strives to keep current with recent building trends and emerging materials and techniques. He is always looking for ways to make buildings better - safer, more durable and energy efficient. As a company, they do a good job maintaining communication, setting obtainable timelines, creating a realistic budget and advancing the project forward. Its sometimes challenging to quantify to homeowners what separates one builder from another in terms of quality and cost. Bayview’s work represents a good investment. One can spend considerably more and have nothing to show for it or a little less to have a far inferior product. They pay attention to the small details that create a high quality end product. 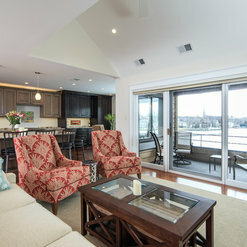 Bayview Builders has completed seven projects designed by Scott Rand Architects to date. These projects have consisted of both new custom residential construction and complete residential remodeling and makeovers. All work by Bayview has been performed in the most professional manner and to the highest standards of quality expected of this office. Bayview's project managers are highly organized and thorough in their management of the project from start to completion. Bayview's cost estimating is detailed and accurate. Their pricing is competitive, with a balanced approach to both value and quality. Bayview's relationships with our clients, the owners, have been truly exceptional. They have paid great attention to any and all thoughts and desires the owners have expressed. Their in-house labor force and all subcontractors are skilled craftsmen who take great pride in their labor and the final product. This office anticipates many more successful projects with Bayview Builders in the future. My husband and I hired Bayview Builders to do an 2,000 sq ft addition to our home that included a new kitchen, master suite, family room and playroom. The project also included significant changes to the existing home. Dave and his team are great to work with. He does a great job managing the sub contractors... his team is professional, talented and curtious. Dave is an out of the box thinker. His ability to work with current technologies made our project run smooth. He would thoroughly research anything that he did not know and would be back to us in a very timely manner. His cost saving value engineering was always appreciated. We have done three renovations and this last one was by far our favorite. To spend 6 plus months working along side a contractor and have no complaints is a milestone. I would not hesitate to recommend Bayview Builders for any size project... new build, renovations, additions. We have worked with Bayview Builders many times over the years, and have always ended with an outstanding project and positive feedback from the clients. The whole team at Bayview is on point and knows how to get the job done- well! 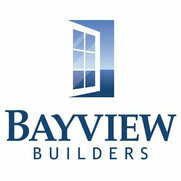 I cannot speak highly enough of our experience with Bayview Builders. I had done many renovations over the last 30 years and none were as easy and flawless - and enjoyable. Our project manager was outstanding and paid incredible attention to the details and execution of the architects plans. The renovation was completed on time and within the budget - subject to changes we requested. I continue to use the subcontractors associated with this project. They are the best! We hired Bayview Builders to build our home. We were starting with an empty lot. Everyone we dealt with at every step was kind, knowledgeable, prompt, respectful, helpful, professional, tidy, honest and extremely skilled. The blueprints were done well from an architect but all of our expectations of the house were exceeded. They totally understood our vision and respected it and made it real! We will and have recommended them. We would hire them again! 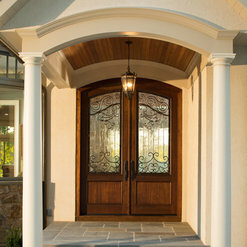 Bayview made the process very easy for us to build our dream home. 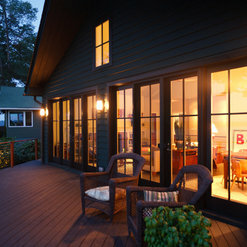 Bayview Builders was the general contractor for a client of mine. They are exceptionally well organized, on top of the budget management at all times, and have superior project management practices. 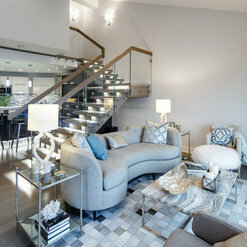 They approach every aspect of construction activity with a unique blend creativity and practicality. I look forward to the next time I have the privilege of working with such an awesome group! 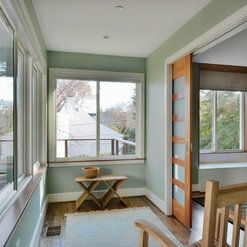 I want to take a minute to express how thrilled I am with the job performed by Bayview Builders. It far exceeded my expectations, which were pretty high! The entire crew was professional and courteous, and I thoroughly enjoyed the process from start to finish. Thanks, Bayview Builders, for a job well done. Our project with Bayview began in December 2011 and was completed in April 2013. 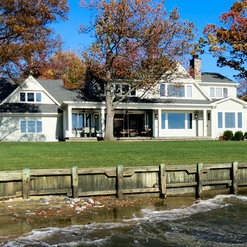 It consisted of dismantling an existing structure and building a 3-story, 4,500 sf home on Spa Creek in Annapolis. From beginning to end we were and continue to be impressed with Dave and his longtime team of professionals. Dave has a remarkable combination of strengths, i.e., organization, communication, and extraordinary knowledge of the building process. He is intelligent, low-key, and has zero tolerance for anything but the highest quality work product. Don and I were very hands-on in the construction of our home and found the process of working with Dave and his team to be a complete pleasure. In short, we happily endorse Bayview Builders as being at the top of their game and would recommend them without reservation to anyone looking for a top-notch residence. And we are happy to call Dave and his team our friends. Commented: What brand is the decking?The railngs were custom fabricated out of mahogany. Commented: what type of gutters are these and what size?Thank you for the question. The guttering is white aluminum 6" half round with 4" round downspouts. Commented: Details.Thank you for the question. 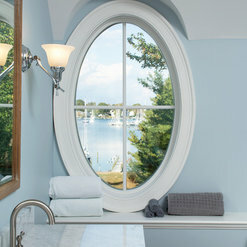 The exterior color is Benjamin Moore OC-61 White Diamond. Also the deck in the photo is 10' deep by 20' wide. Commented: PaintThe paint color of the bar area is Benjamin Moore 2049-50 Spectra Blue.